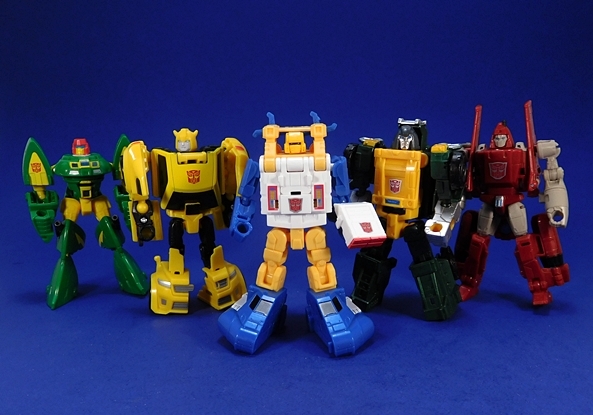 Ever since the Generations line, Hasbro has been putting out some damn fine homages to the old G1 Minibots via their Legends Class figures. Personally, I’d like to see a few of these released as Deluxes, but I’m still happy to take what we get. 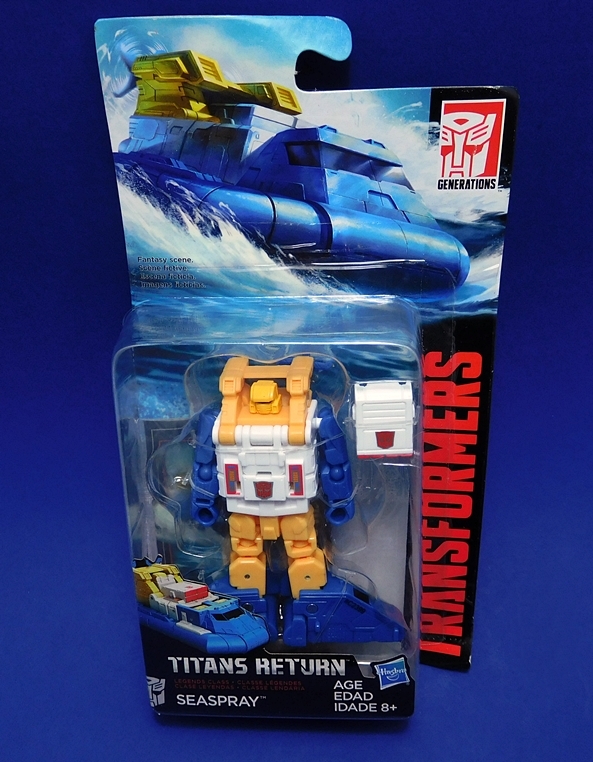 Enter Seaspray! The last time we saw an official figure of this guy was back in the Reveal the Shield line of 2010. 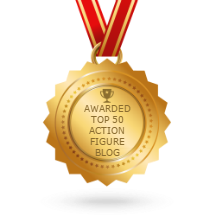 That was a pretty cool figure, but apart from the hovercraft alt mode, it didn’t make an attempt to recapture the glory of the G1 design. 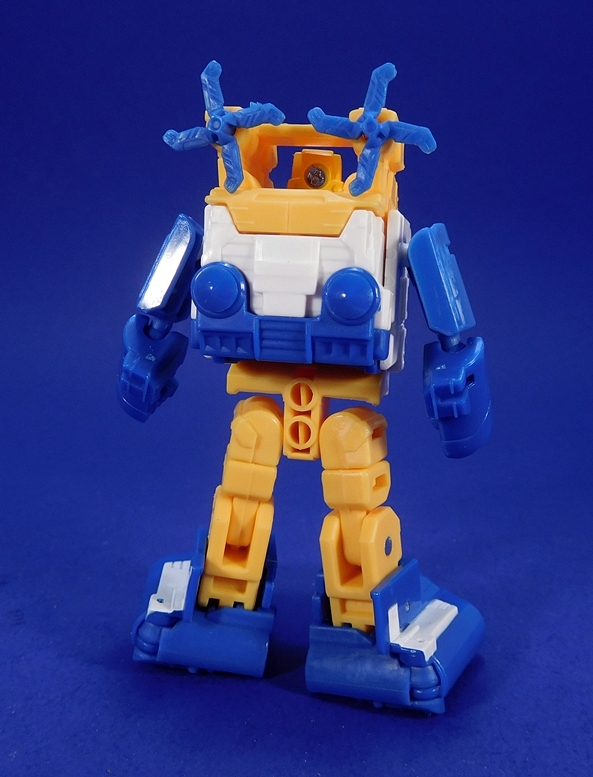 Perhaps as a result, Seaspray has received a fair bit of attention from the Third Party convertorobot makers. I never picked up any of those, so I’m anxious to see how Hasbro’s new official crack at the character turned out. 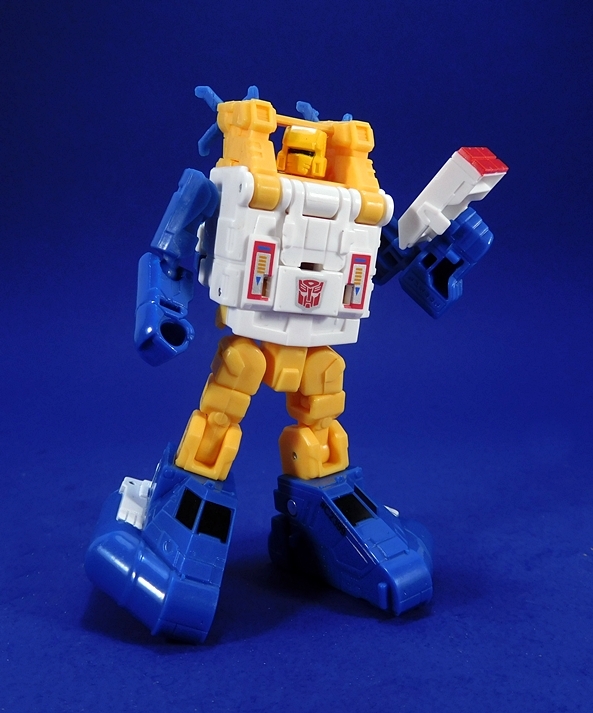 Also, I command that everyone read this review out loud in Seaspray’s ridiculous gargling voice. 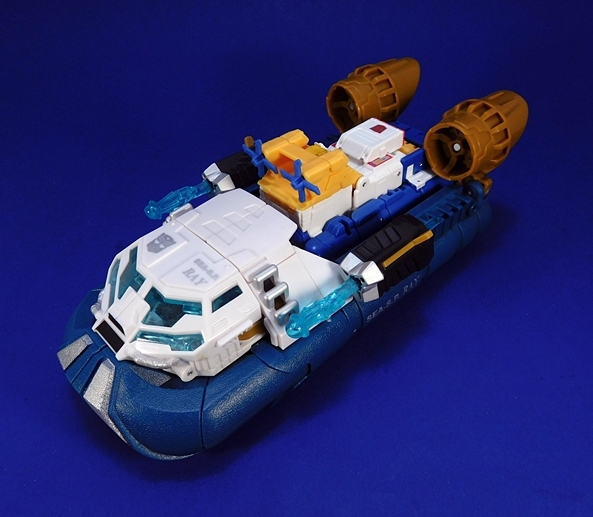 This little blue, white, and yellow hovercraft is a great homage to the original toy and derives its deco almost entirely from colored plastic. Indeed, apart from the black painted windows and some tampo detailing on the top, it gets by with almost no paint at all. There’s also not a whole lot of sculpted detail present, but you do get some little doors on the sides that give a good idea of the intended scale here. I wouldn’t say it’s a terribly attractive alt mode, but it definitely works for what it is. 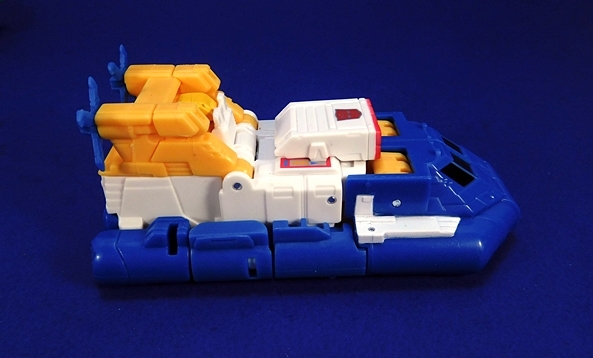 The box on the top is removable and since it forms Seaspray’s weapon in robot mode, I’m guessing that’s the purpose it serves here as well. What kind of weapon it is, I’m not sure. It looks like it could be some kind of heat gun, or maybe it opens up to reveal a rocket pack. 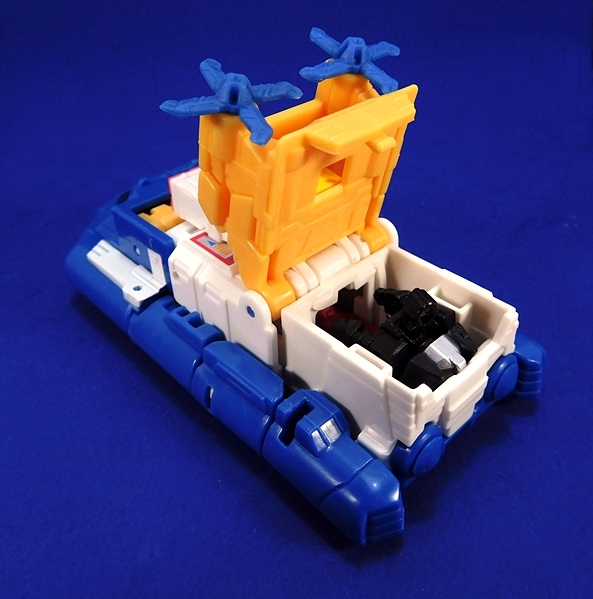 What does open up is Seaspray’s back area to reveal a pilot seat for a Titan Master. I’m still impressed that Hasbro has been able to engineer these little guys with room for the little bots. 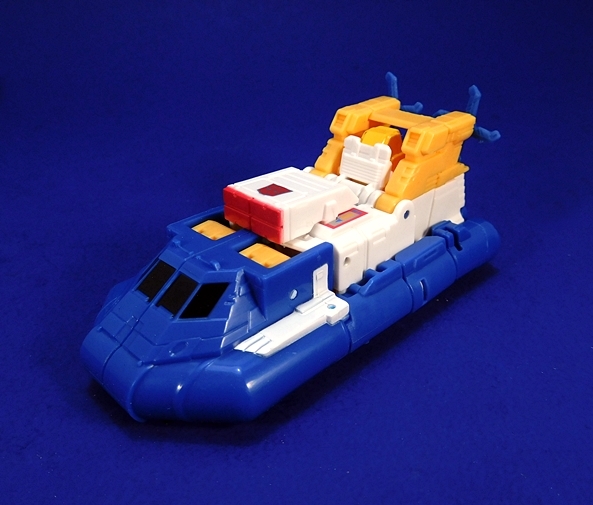 I put Convex in there, just because he’s mostly black and easier to see against Seaspray’s white compartment. 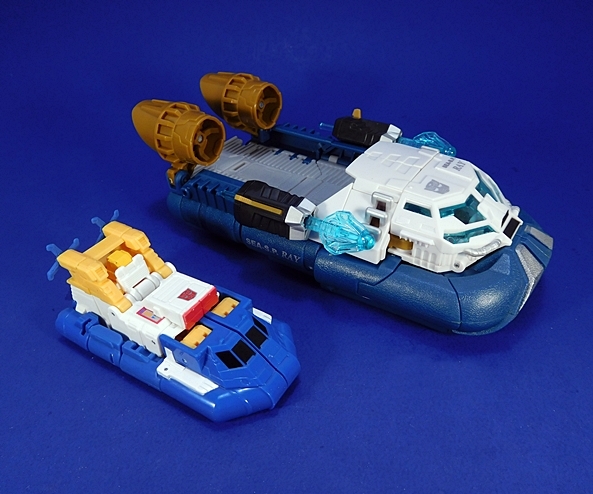 In terms of scale, Seaspray follows the standard G1 toy logic that if you’re a Minibot, you’re alt mode is the same size as all the other Minibots, whether you’re a giant hovercraft, an A-10 Warthog, or a compact sports car. 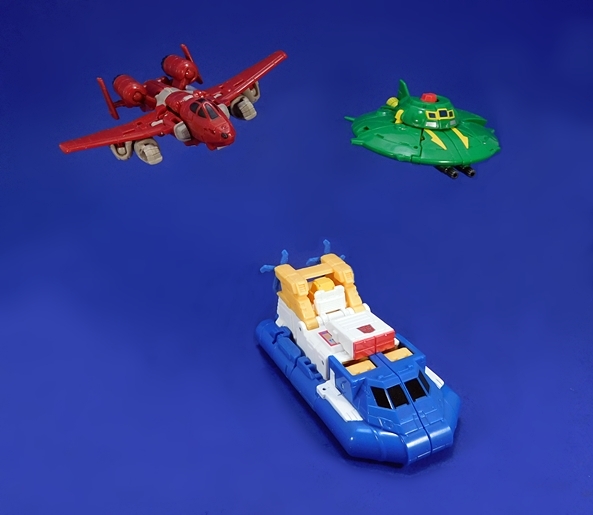 Needless to say, I’m fine with this and I think Seaspray looks great next to the myriad of other Minibots that have been released in the Legends Class assortment. DEM FEETS! 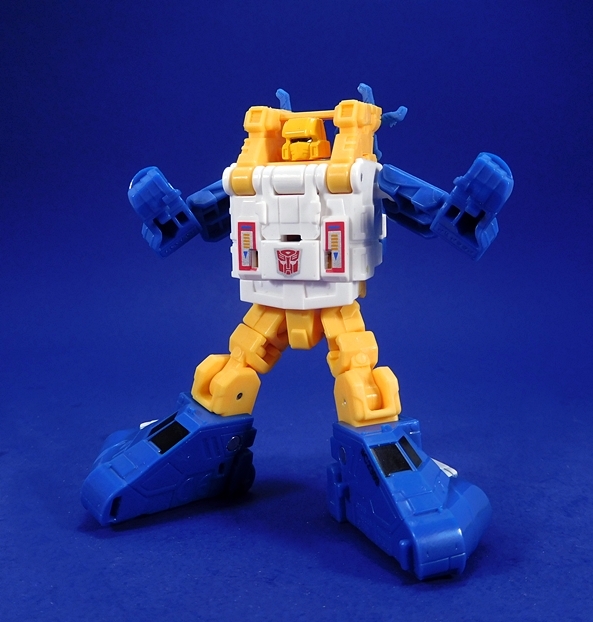 Seaspray is sporting some enormous feet. I mean, they’re big! How big are they? They’re so big they had to turn them sideways for him to fit in the package. That’s not a joke. Look at the in-package picture, they really did have to turn them sideways. These giant clodhoppers should bother me, but surprisingly they don’t. I think they go well with his big slab of a chest. What does irk me a little are his arms, which could have been a little bigger, especially in relation to his feet and chest. 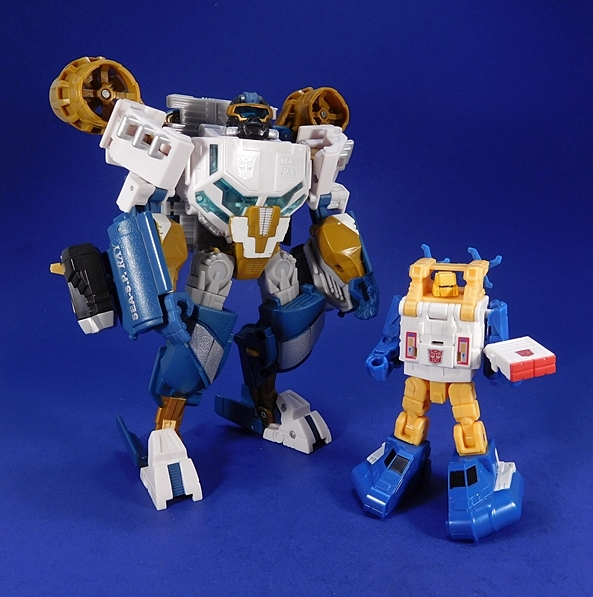 They’re not as bad as Bumblebee’s disproportionate meathooks, but I would have liked a little more bulk there. The head is an interesting choice, as it favors the original toy over the Sunbow animation model. Instead of individual eyes, he’s just got a visor band running across the top of his mouth plate. 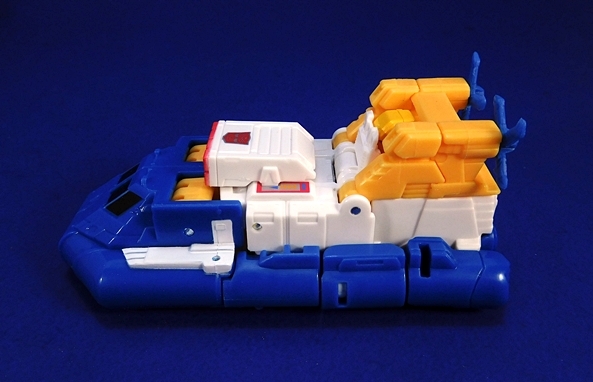 It looks fine, but given a choice, I’ll almost always take Sunbow over the original toy. Also, check out those gorgeous tampos on his chest. That’s some quality work, Hasbro, and I hope we see more of it. The weapon that I mentioned in his alt mode tabs into the slots behind his hands. It’s a rather unconventional looking weapon, but I like it a lot. Although if you pose him the right way with it, it almost looks like he’s carrying a pizza. In any event, it’s a treat to get it since so many of the other Legends Class Minibots don’t come with guns any more. 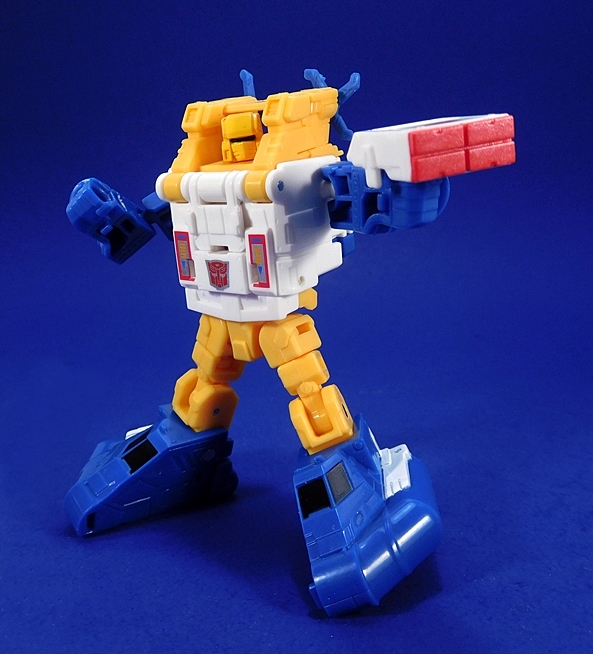 And in case you forgot what his predecessor looked like, here he is with Voyager Class Sea Spray. 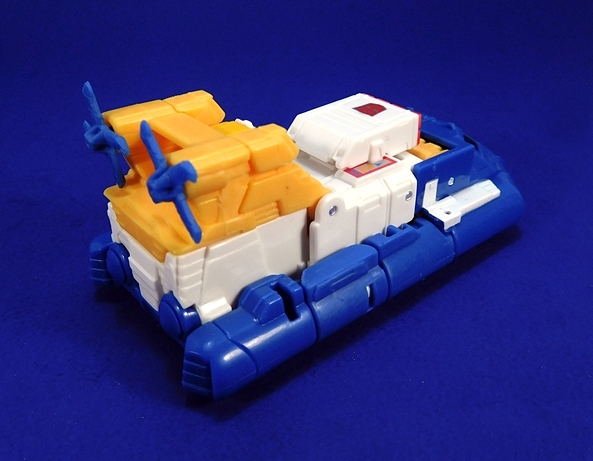 Oh yeah, and Seaspray will fit inside his bigger namesake’s cargo area, but it’s a mighty tight fit! 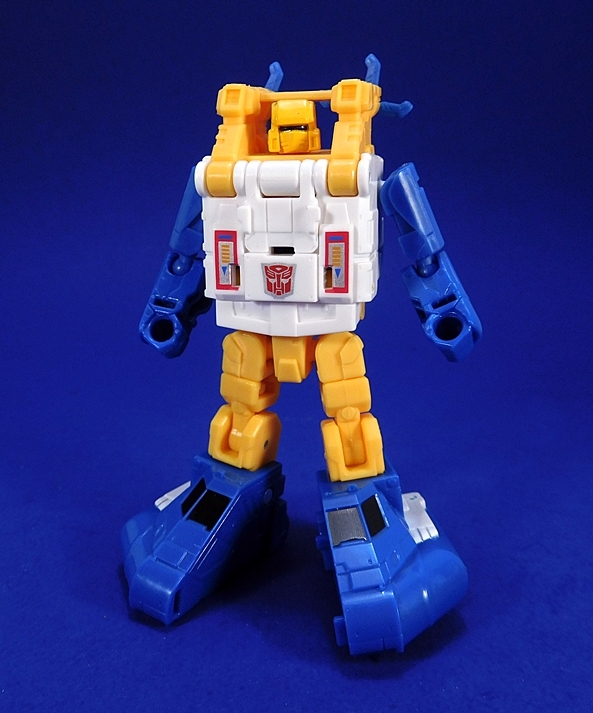 I thought Seaspray was going to be really tough to find, but Primus has been smiling down on me when it comes to Legends Class figures lately. 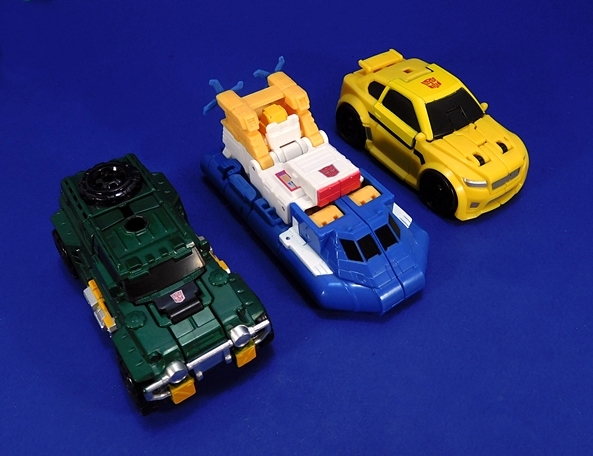 Not only did I find Brawn really easily, but Seaspray here practically fell right into my lap as well. I really liked the previous Voyager version as its own figure, but it really wasn’t Seaspray to me, and that’s where this figure succeeds brilliantly, despite a few design choices that might rub people the wrong way. Even still, I’d proudly display him besides Brawn as two of the best Minibot updates so far, and I’d probably throw Powerglide and Cosmos in there as well. 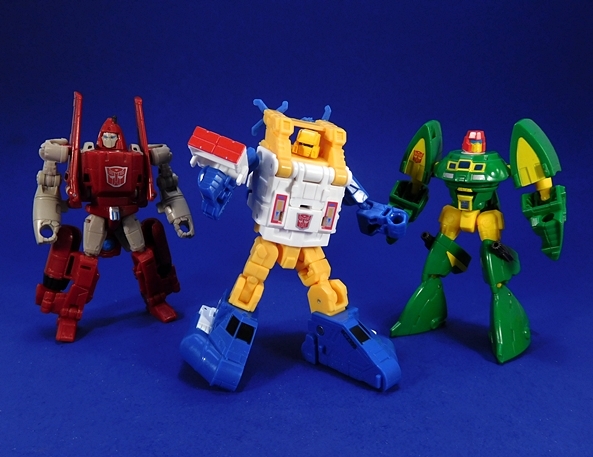 If you’ve got ten bucks burning a hole in your pocket and you love your Minibots, I can’t recommend him enough, but then I say that about almost all the Legends Class figures. I like it. If I can find one in Walmart I’ll snag it. I have one of the 3rd party ones (iGear I think?) but I like the gimmick of seats for Titan Masters. 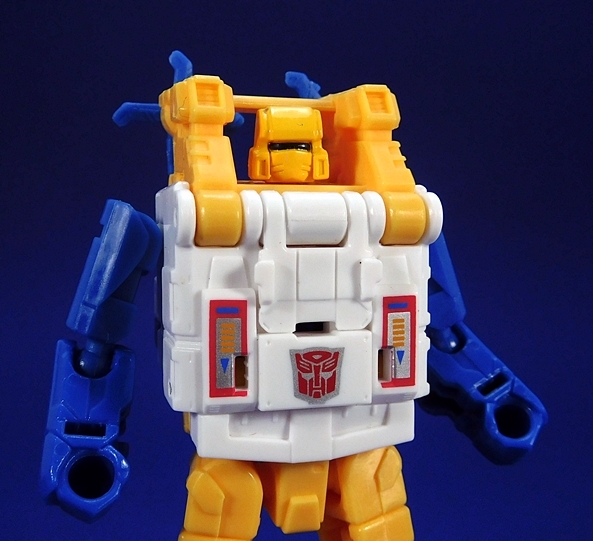 In fact I’m buying the Takara version of Bee just to get the clear windshield.